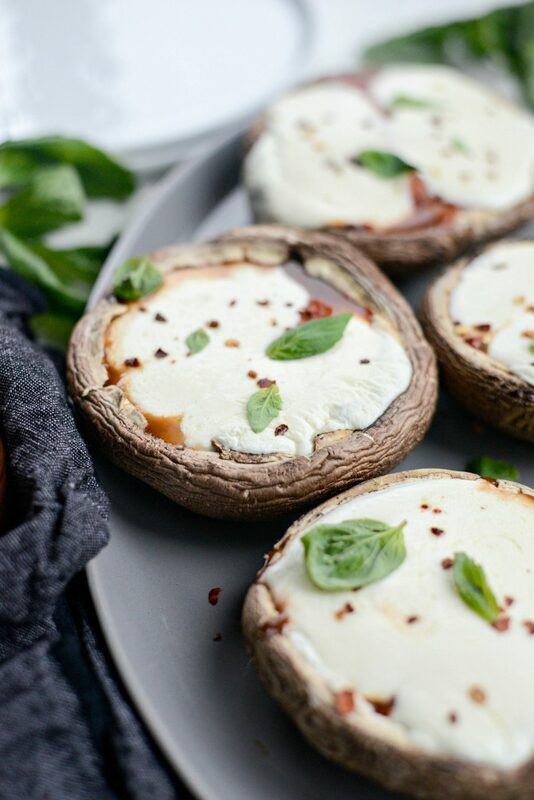 These Roasted Caprese Portobello Mushrooms are a delicious meatless option whether it’s for lunch or a light dinner. 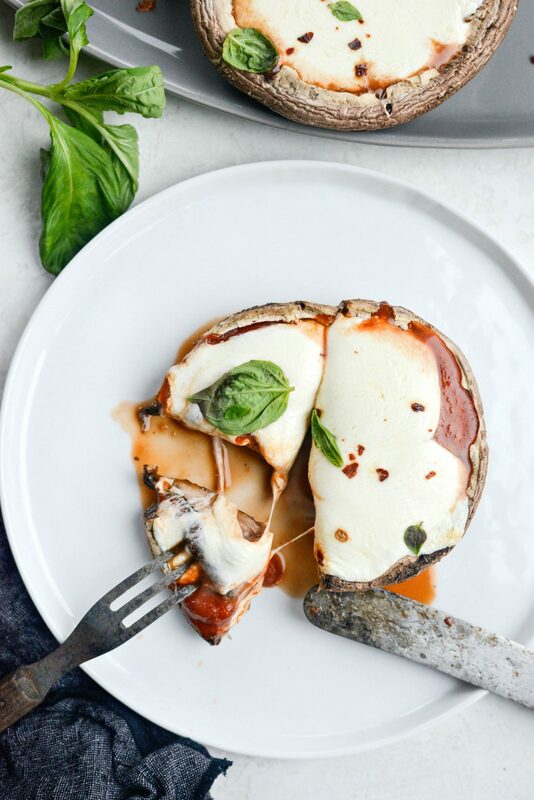 Large portobello mushroom caps are seasoned and topped with marinara, fresh mozzarella cheese and served with fresh basil leaves. Serves 4 in about 25 to 30 minutes. One trip to the grocery store and I had a new recipe to make. This is the sort of thing that happens to me from time to time – or always. For example, I walked in for ziplock bags and walk out with a cart full of last minute meal ingredients. It’s even worse (read: expensive) when I go to Target. Once I went in to Target to see if they had any fresh basil (they didn’t) and I walked out with a new comforter, pillow shams, a set of sheets, 3 sweaters and some random bowls. Basically I shouldn’t go unsupervised into any store whatsoever. Luckily, this shopping trip wasn’t that bad and neither is the ingredient list for these. 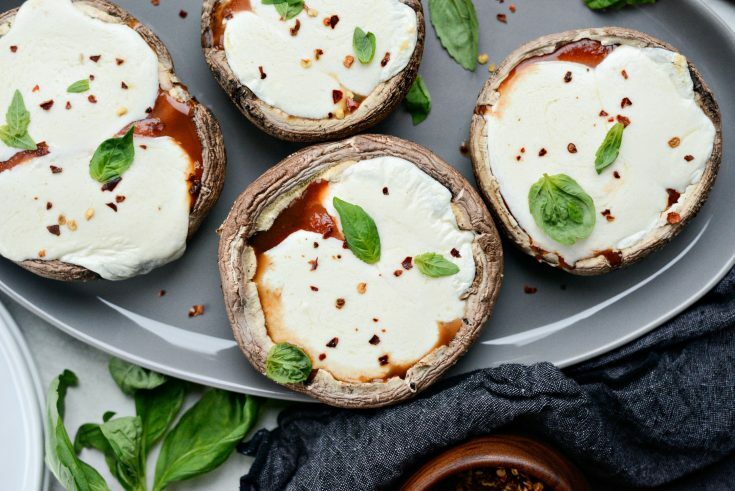 All you need is 4 large portobello mushroom caps, salt & pepper, about 1/2 cup of marinara and 8 ounces of fresh mozzarella and basil. First things first, use a paper towel to dust any dirt off of the top and underneath the mushroom caps and remove the stems by gently rocking them loose. 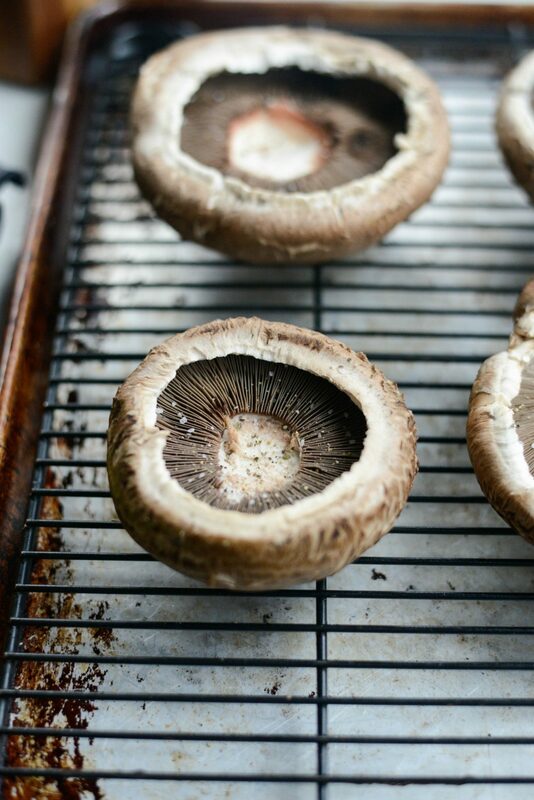 Place the caps, stem-side facing up onto a wire rack that is set into a rimmed, metal sheet pan. 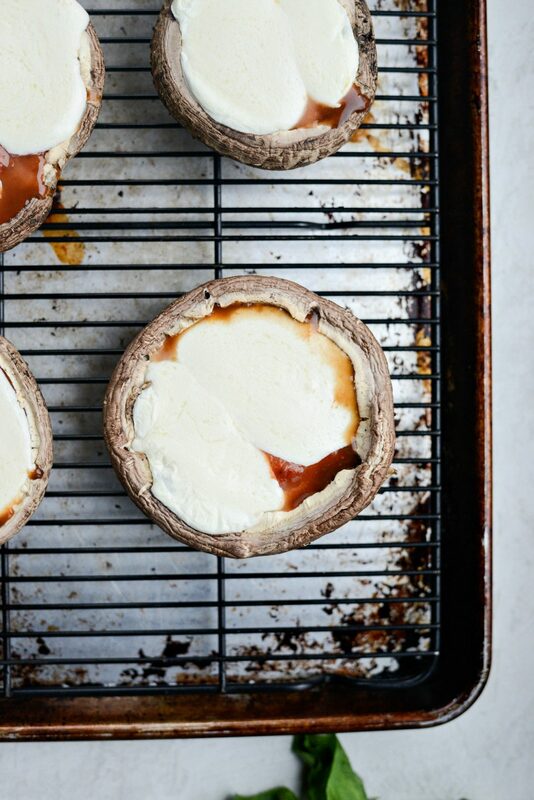 This helps the air to circulate and so the mushrooms don’t sit in any of their liquids that escape when roasting. Season with a little kosher salt and a few grinds of black pepper. 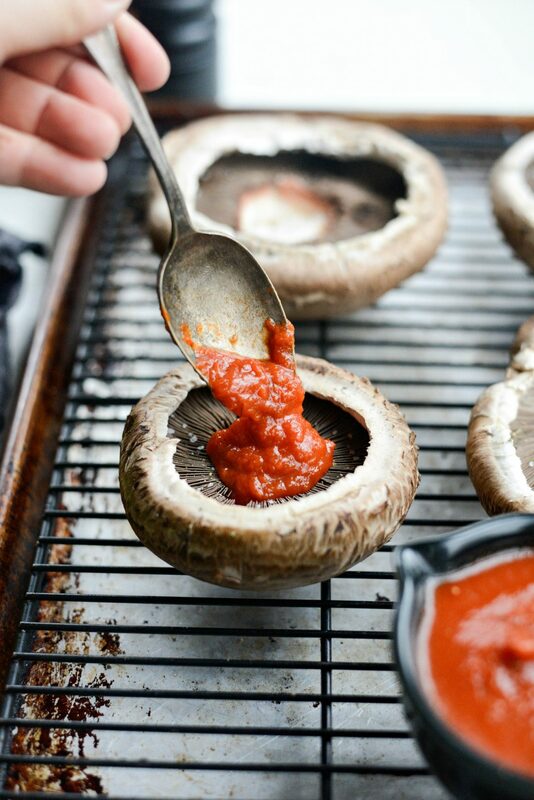 Then add in a few spoonfuls of marinara, use your spoon to scoot some of the sauce under the lip of the mushroom. 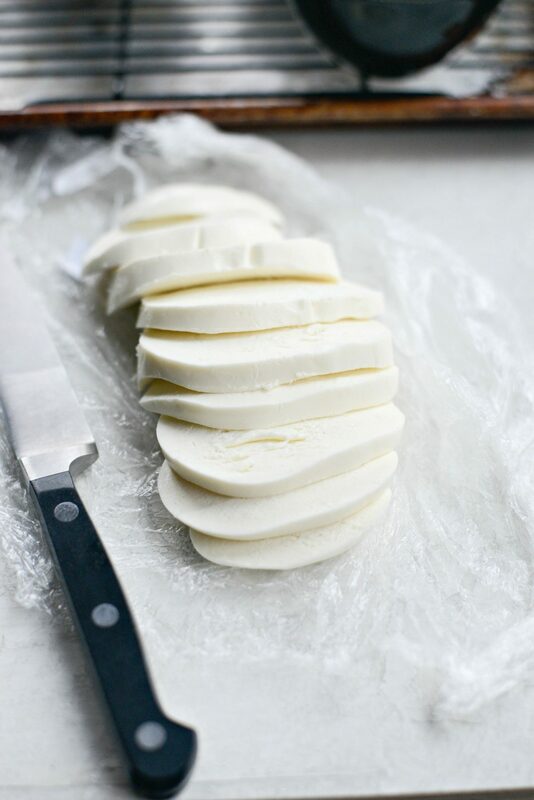 Slice up the fresh mozzarella and top each cap with a couple of slices. 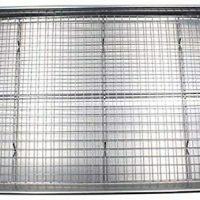 Slide the pan onto the middle rack of your preheated 400° oven to roast for 18 to 20 minutes. No matter what I bake or roast, I always rotate the pan halfway through to ensure even roasting. My oven tends to be hotter in the back than in the front so this is how I get them to cook evenly. These smell amazing and look at that melty cheese! Then just top with a few fresh basil leaves, and for a little kick, I like to top mine with some red pepper flakes. Since I was little (ironically) I’ve LOVED mushrooms. They may be one of the ugliest vegetables around but in a salad, soup or stir-fry, cooked or raw, it doesn’t matter to me. Because I simply love them so much. 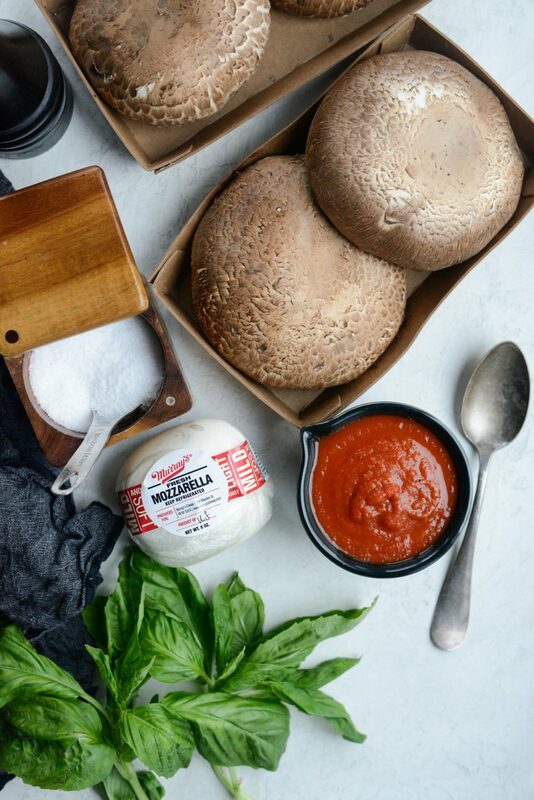 Cremini and portobellos are my favorite to cook with [and eat]. 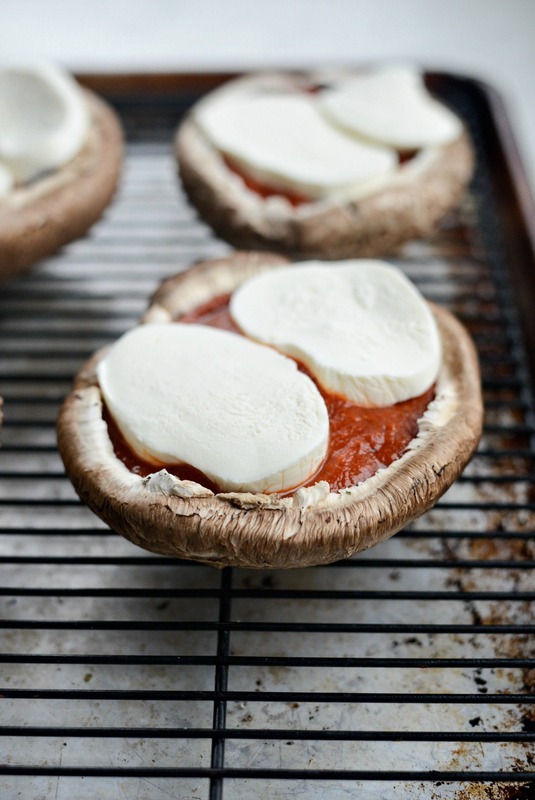 I use portobellos as the “main” mostly as they’re large in size and are so meaty in texture. It tricks my brain sometimes because I’m completely full and satisfied after I eat them (like these fajitas or this burger) just like I would if I ate beef. 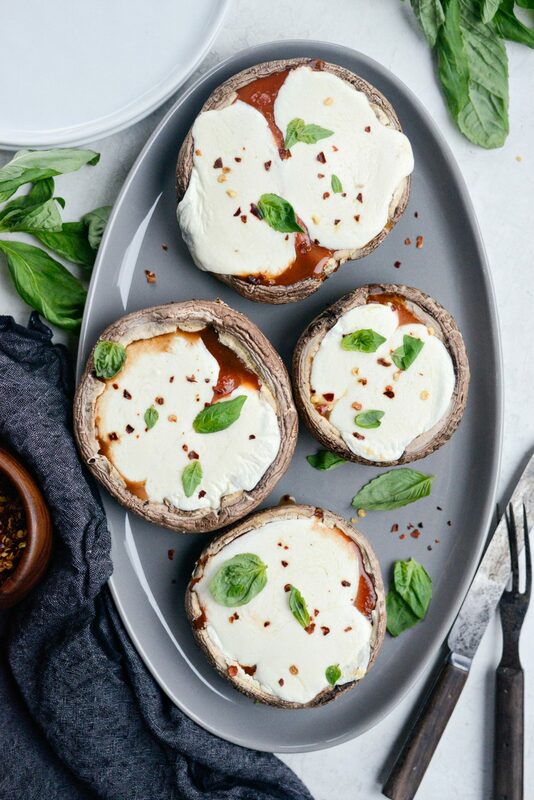 With that said, maybe you’re avoiding carbs or looking for an easy meatless option, these roasted caprese portobello mushrooms are IT! 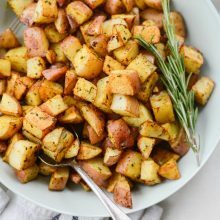 Simple to whip up and just as flavorful and satisfying. Enjoy! 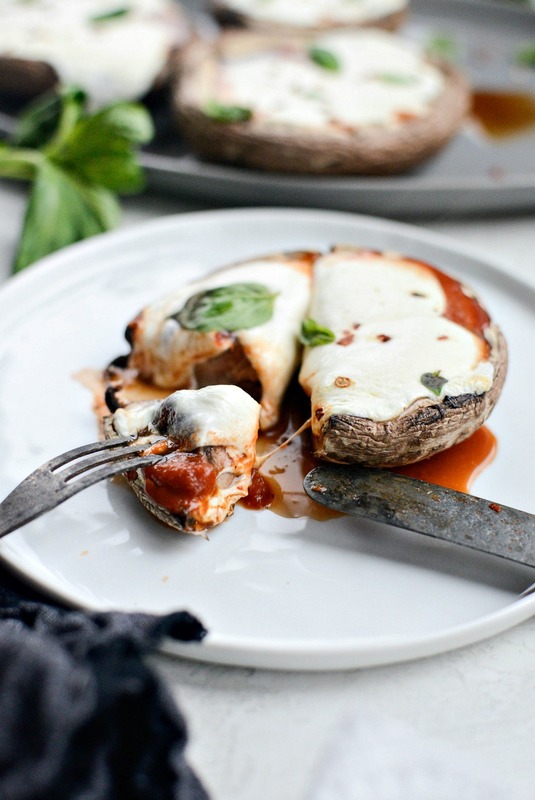 And if you give this Roasted Caprese Portobello Mushrooms recipe a try, let me know! Snap a photo and tag me on twitter or instagram! 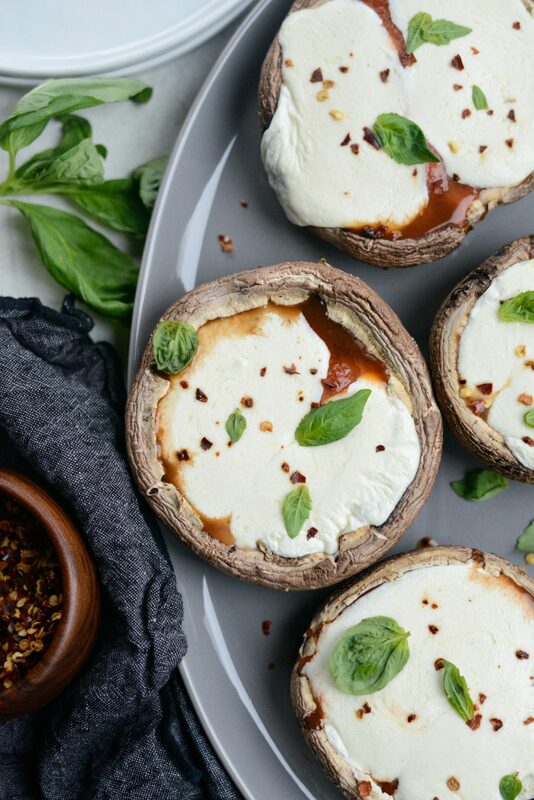 These Roasted Caprese Portobello Mushrooms are a delicious meatless option whether it's for lunch or a light dinner. 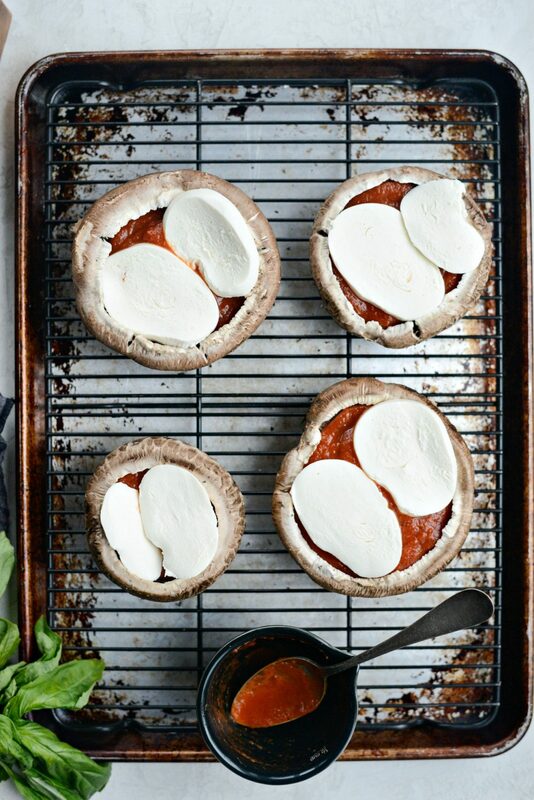 Large portobello mushroom caps are seasoned and topped with marinara, fresh mozzarella cheese and basil. Serves 4 in about 25 to 30 minutes. 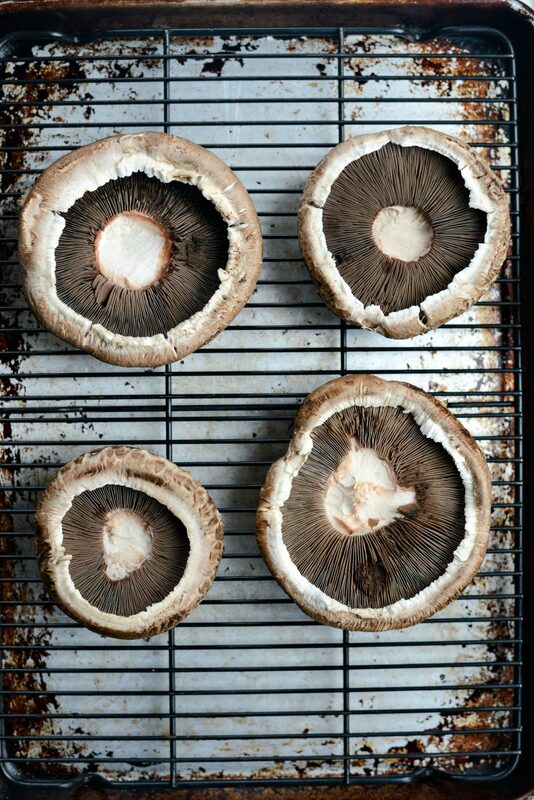 Place the prepared, de-stemmed mushrooms (stem-side facing up) onto a wire rack that is set into a rimmed metal baking sheet. Season each cap with a small pinch of salt and pepper. 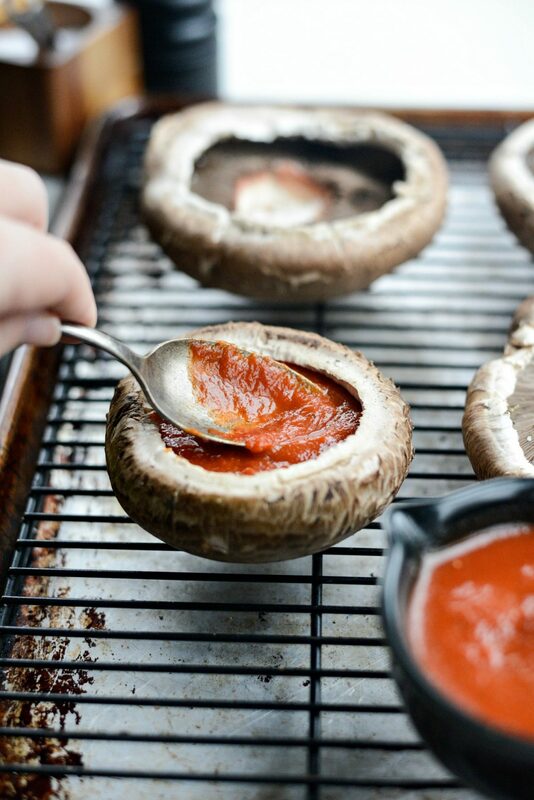 Spoon and spread the marinara into the middle and underneath the lip of each mushroom. 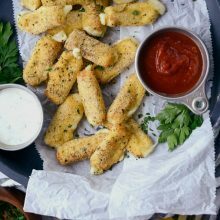 Top each one with a couple slices of fresh mozzarella and bake for 18 to 20 minutes or until the cheese is melted and the sauce is bubbling. 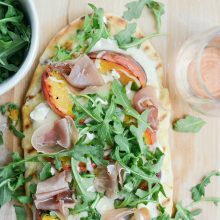 Serve immediately and top with fresh basil and red pepper flakes for some kick. 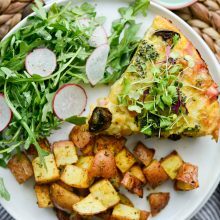 To make this a complete meal, serve them with a small green side salad. Perfect post holidays treat. Thank you much for refreshing our menu ! Do you need to scrape the gills off before filling? 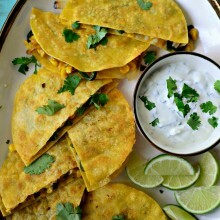 These look like they will taste SO great! 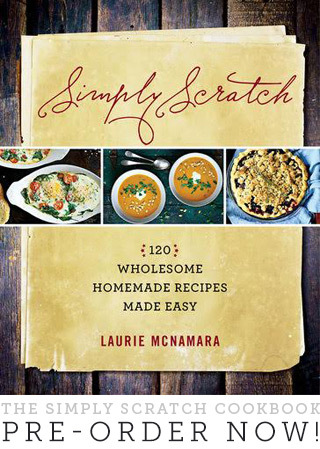 Thank you for sharing your kitchen inspiration with me, and for helping to make my cooking better and more adventurous. 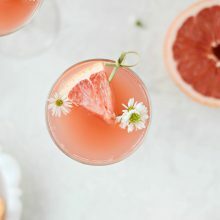 I’ve enjoyed this food blog for years, and am so impressed with your ability to continually get better and ever more inventive – food, photos, everything! Well done! Kelly! thank you so much for your kind comment – it made my day! I appreciate you!